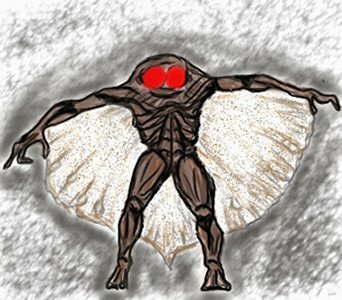 The very first sighting of the Mothman was supposedly on the night of November 15, 1966, near the town of Point Pleasant, West Virginia. Two married couples, Roger and Linda Scarberry and Steve and Mary Mallette were driving past a closed down World War II ammunitions plant that was commonly called the "TNT AREA" by locals. They were only about six miles north of the city proper, in an area set aside by the city as a wildlife preserve for birds, called the McClintic Wildlife Preserve. The area had many underground tunnels and caves; an easy hiding or nesting place. The first thing that caught their attention was the glow of two large red eyes peering through the darkness. They could soon make out the shape of a creature six to seven foot tall, with the basic shape of a human with what appeared to be wings folded around his sides and back. "It stood taller and broader than a man, walked in sort of a halting shuffle on humanlike legs, and emitted a squeaking sound." "The red, glowing eyes, set into the shoulders, seem to have been more terrifying than either the size of the creature or span of its batlike wings." The eyes were said to have an "hypnotizing" effect. Was he the manifestation of a 200 year old Shawnee Indian curse put on the area of Point Pleasant?